It's not Christmas yet, but it will be soon! I want to do something cute in my travelers notebook because it makes me so happy and helps me stay organized! 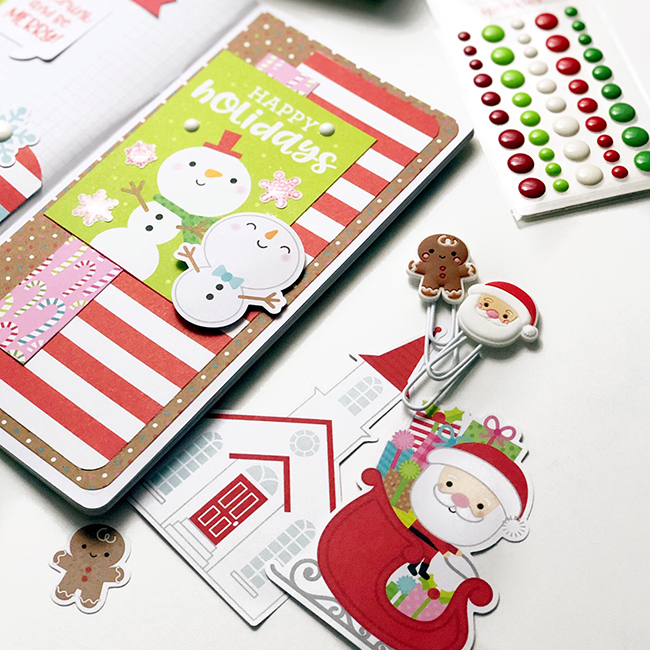 I love the Christmas Town collection - it's perfect for all of my December Travelers Notebook pages! I'm really enjoying planning my special days in a travelers notebook. I can decorate and I can also keep track of activities and to-do lists. Using the Chit Chat is so easy on these pages -- they really make the perfect accents! I love using both the Chit Chat and the Odds & Ends in combination with patterned paper! They are all just perfectly coordinated and I really love the kraft colored backgrounds included with this collection. It just feels so perfect. The Sprinkles; are the best embellishments in a planner -- their size is just amazing! But I'm really loving them as bullet points! They truly help me keep track of lists and other important things I need to remember. I plan on keeping up this special insert all through the year. It's such a cute and fun way to keep track of the days and events I have going on! So fun and festive!!! Love the sprinkle bullet points!